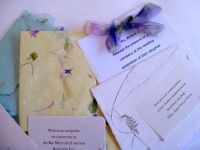 Set the stage for your own wedding or special event by creating handmade paper for invitations. 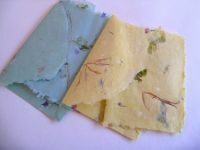 Seastone Papers' fully equipped studio offers rental for groups of up to four adults to make sheets of handmade paper for invitations. The fee includes prior consultation, instruction in sheet formation, two pounds of prepared cotton/abaca pulp, full time assistance throughout, and drying of completed invitations. You may supply your own botanical inclusions or we can provide them for an additional fee. Bring a picnic lunch to enjoy in the shade of the beech grove, and a camera for recording this uniquely personal and joyful activity.